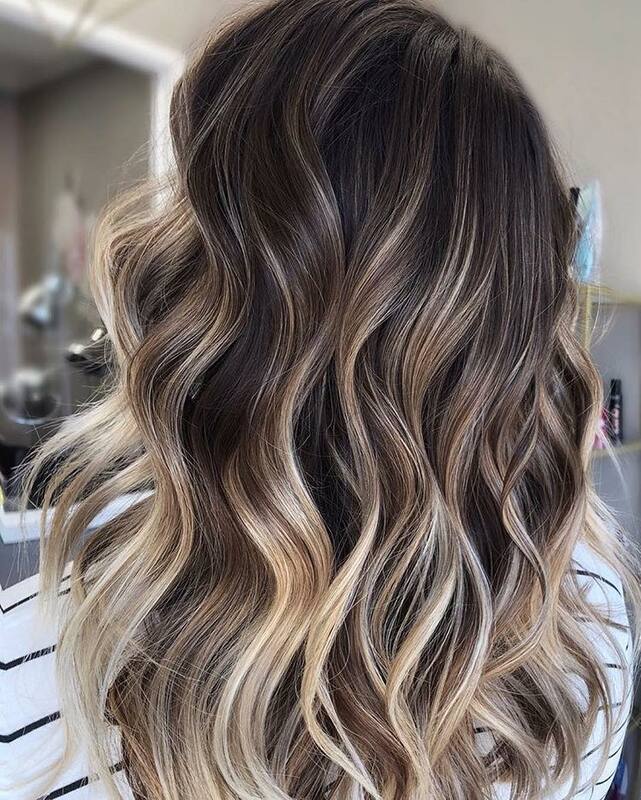 Medium long hair with ombre balayage is a trend that shows no signs of petering out! 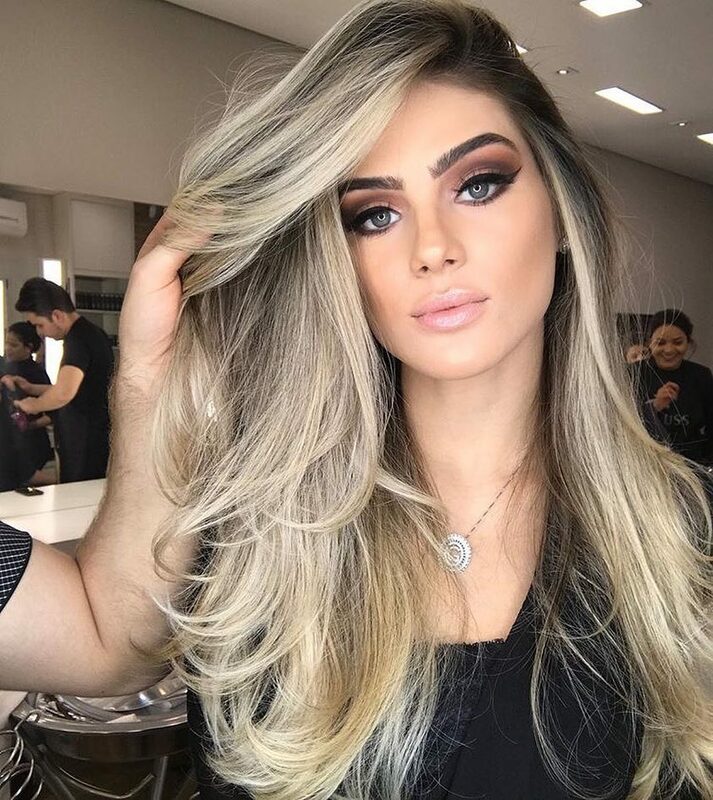 And this super gallery of new blonde haircuts for mid-length hair, includes ultra-natural beiges, neutral-blonde shades and stunning, bright white. 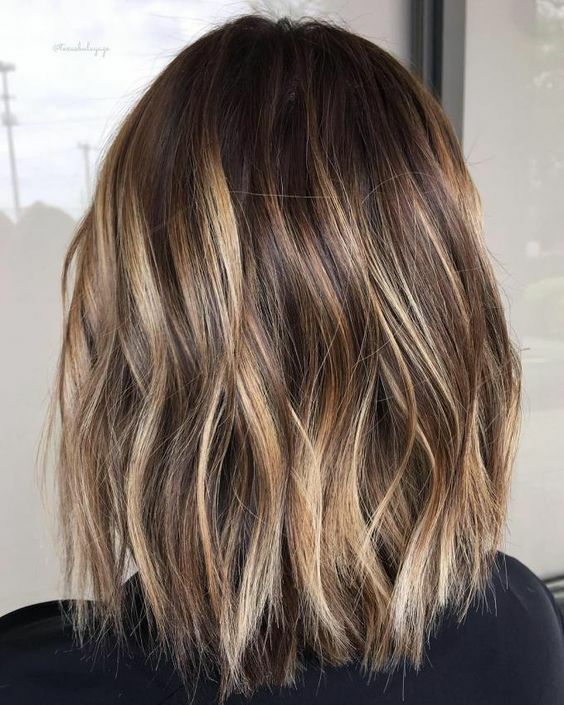 Medium haircuts are easier to style, trendier and more versatile, so is it time you had a long to medium haircut makeover – with one of these fabulous new color designs? With a centre-part, this is a style suitable for oval face shapes. It’s a casual look the stylist has cut to drape down and cover the outer edges of the eyes, neatly concealing laughter-lines. Tousled waves soften the face and shorter layers between neck and collar-bone also soften the line. Switching from long to a medium, casual bob makes teenagers appear more mature. But it also makes women over 25 look quite a lot younger! Choppy bobs look great on thick, and medium, hair with enough density for heavily textured tips. Disconnected layers really highlight the choppy, shaggy styling. And with 3 or 4 harmonized blonde shades, including soft honey and light-beige, the effect is edgy, but feminine! Thick, long hair may take a lot of expensive care, but it can be really stunning with expert styling and coloring! This special occasion style has loose, deep waves arranged in defined texture at the ends. And with 3 or 4 carefully blended blonde vertical highlights, plus golden-beige balayage the effect is mesmerising. If you have blue, gray or green eyes and dark-blonde hair, put some pizazz into your image with a neutral-blonde update! 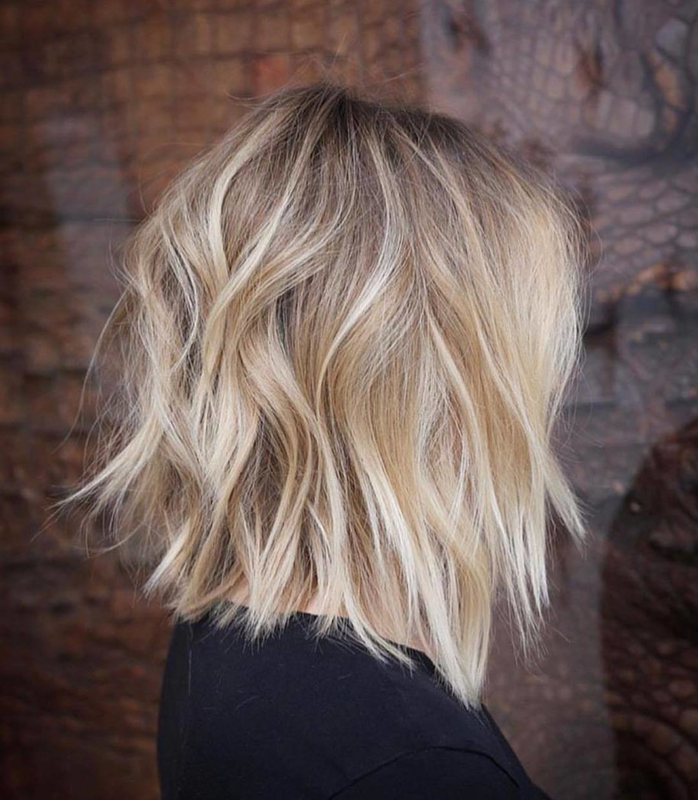 This shade of light beige-blonde is attractive, without being as ‘cold’ as ash-blonde. Lots of fine, vertical highlights transform dark hair, without completely masking the original root color. And it’s a flattering shade for skins with cool, or neutral, undertones. If you go for an all-over color, the result is often flat and artificial looking. 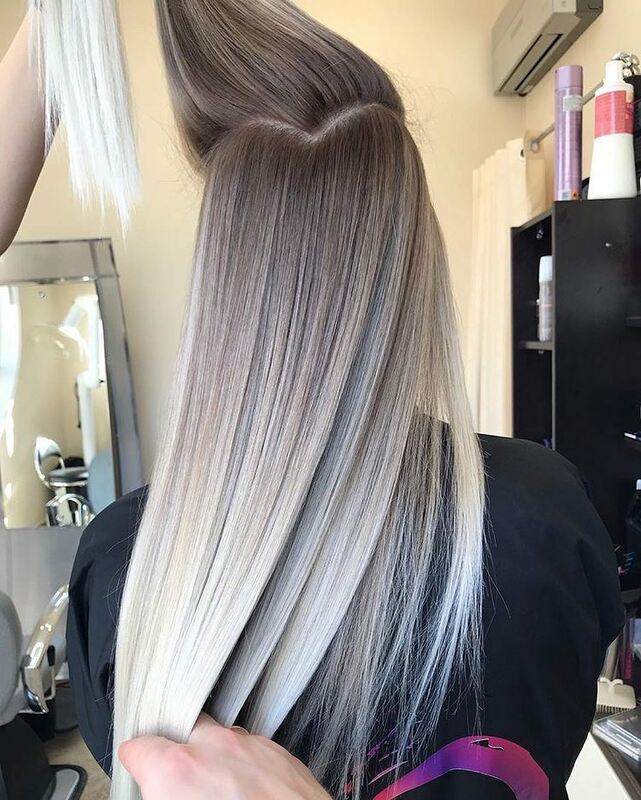 But with a carefully graduated ombré like this, the movement from natural blonde roots to the final white-blonde tips gives a far more natural finish. Even though we all know it never happens quite like this in Nature, we still think it’s a more attractive look! LOL! Long wavy hair is an iconic glamor hairstyle, but too much blonde on those waves can spoil a classy image. 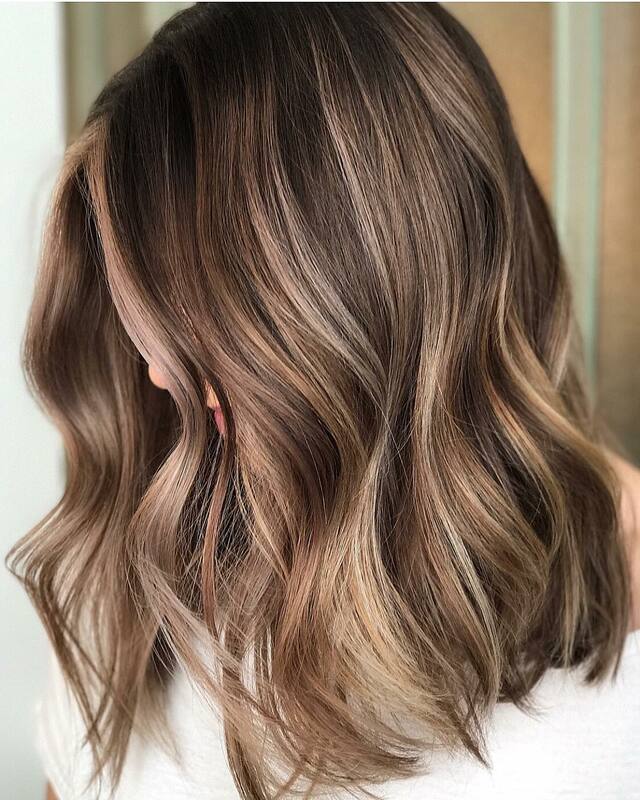 Adding fashionable beige balayage ombré to wavy mid-length hairstyles, highlights movement and texture, without screaming for attention. And, of course, mid-blonde hair color is terrifically flattering to mid-thirties and upwards skin-tones! On the other hand, if you have a straight, medium lob haircut – that’s the perfect background for a stunning color! 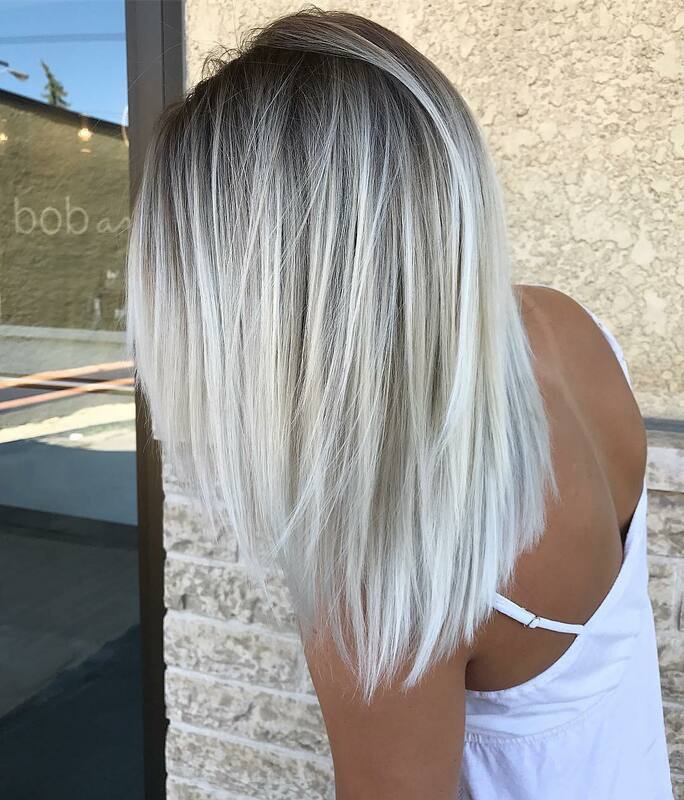 This simple, medium bob with layers near the ends and textured tips, lets bright, white-blonde, color emphasize healthy, swishy hair! And charcoal-gray roots update and soften the popular black and white hair-color fashion, adding flattering 3-D color depth, too! An off-centre parting favors face-shapes between oval and round. This is a natural, long, waved bob with a modern, fashion twist from the unexpected, chopped-across tips. 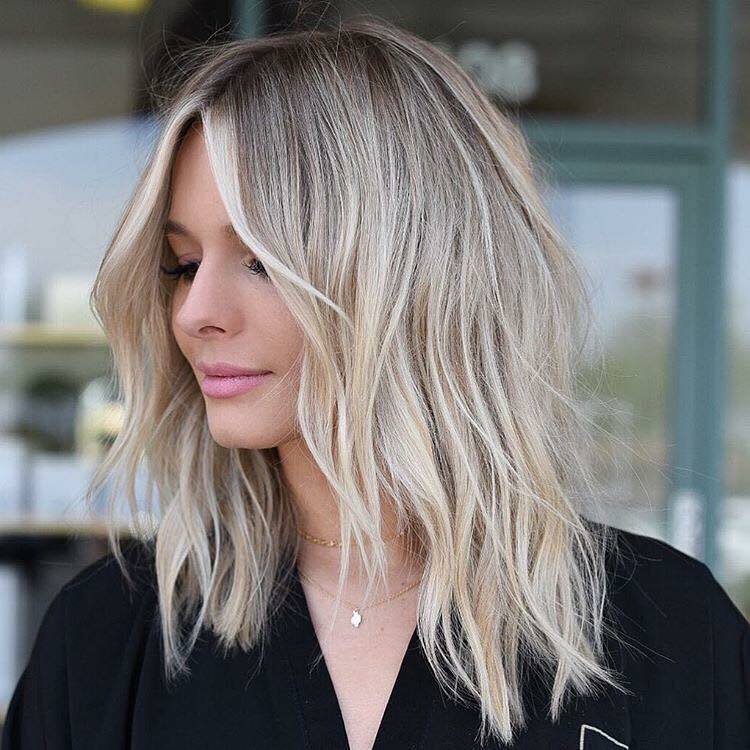 You may hate having your split-ends removed by the stylist, but with a blonde-ombré and the edgier tips, you get a contemporary twist without losing the length! Mixing vertical blonde highlights with ombré balayage towards the ends, creates a trendy, yet natural vibe. Lighter blonde on the soft waves framing the face reflects flattering light and draws attention to the eyes and lips. And with honey-blonde adding warmth to neutral dark-blonde – plus blonde tips with pink and peach toner, the final effect is romantic and feminine! There’s a hot new trend for same-length, medium-short bobs with an uneven, straight-across back. It’s the latest update to the inverted bob, creating an edgier finish from heavily textured, ragged tips. And this contrasts with beautifully highlighted, defined waves in a softly tousled finish above! Mixing, matching and contrasting movement and texture, also adds fantastic 3-D depth to medium-length hairstyles. Blonde isn’t just for women who have naturally fair hair, who need a little ‘lift’ and an ash-blonde toner. Anyone can have fashionable blonde hair, especially with the current range of natural beige hair colors. 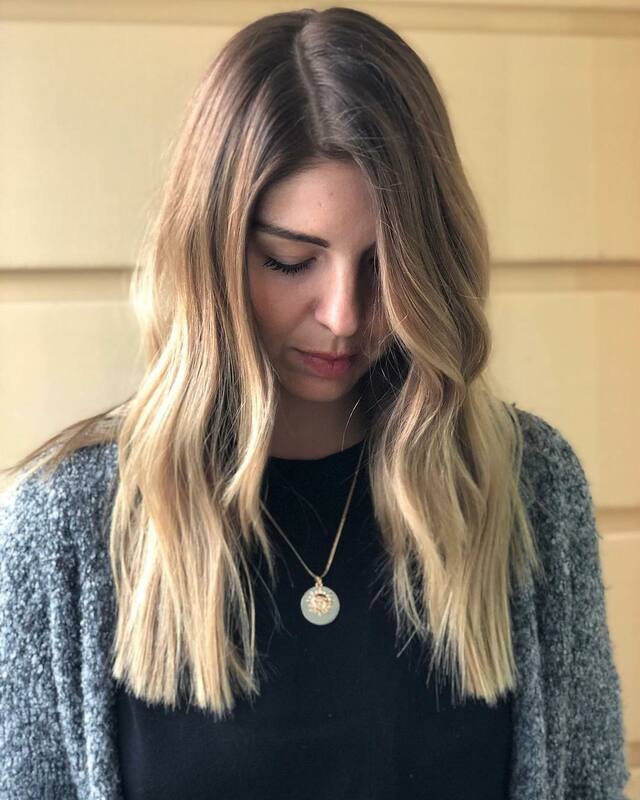 With an artistic, graduated ombré and balayage hair color design, or fine vertical highlights, or all three – mousey hair can become a flattering mid-blonde shade you’ve always dreamed of!